The sunspot has more than a dozen dark cores, many of which are as large as terrestrial continents–and a couple as large as Earth itself. These dimensions make it an easy target for backyard solar telecopes. Of greater interest is the sunspot’s potential for explosive activity. The spotty complex has a ‘beta-gamma’ magnetic field that harbors energy for strong M-class solar flares. Any such explosions will be geoeffective as the sunspot turns squarely toward Earth in the days ahead. The C3-category flare was caused by a filament of magnetism, which rose up and erupted between 0400 and 0600 UT. Some of the material in the filament fell back to the sun, causing a flash of X-rays where it hit the stellar surface. That was the flare. 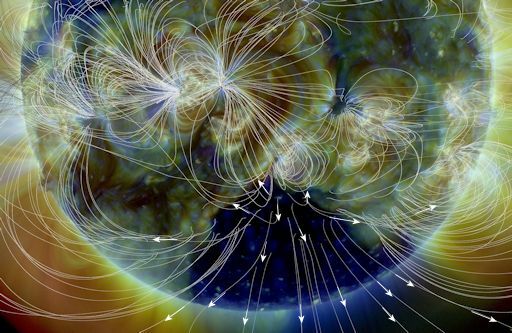 The rest of the filament flew out into space, forming the core of a massive CME. 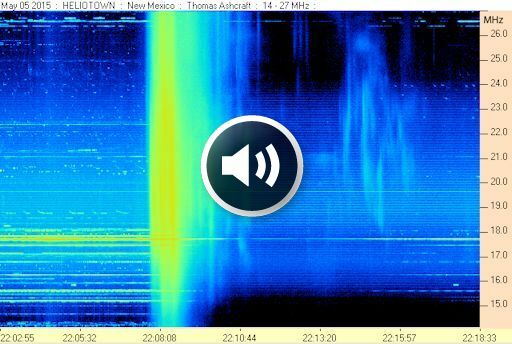 A movie from the Solar and Heliospheric Observatory shows the CME billowing away from the sun. NOAA analysts say it will not hit Earth. 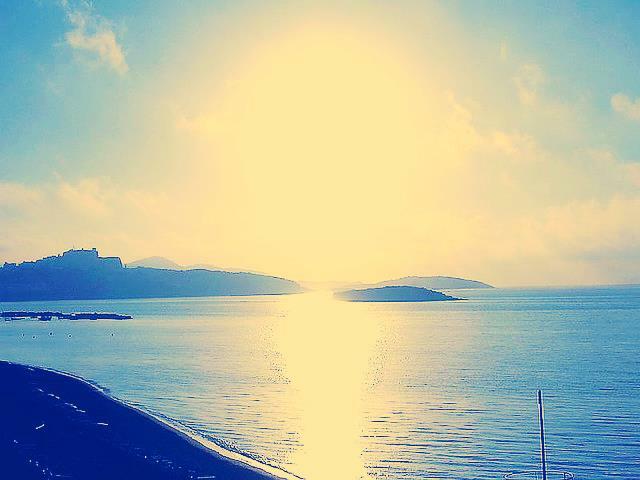 Flares like this, which happen without sunspots, are called Hyder Flares. They help keep solar activity high even when sunspot counts are low. 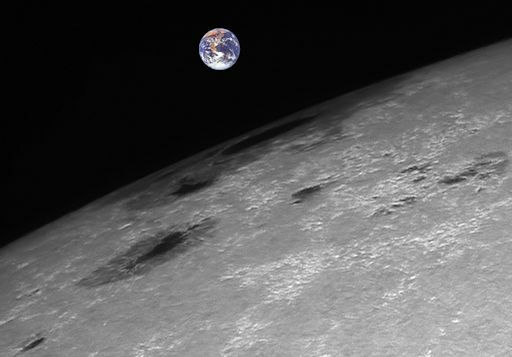 “I inserted a picture of Earth for scale,” says Brahic. The sunspot’s primary dark core could swallow our entire planet with room to spare. 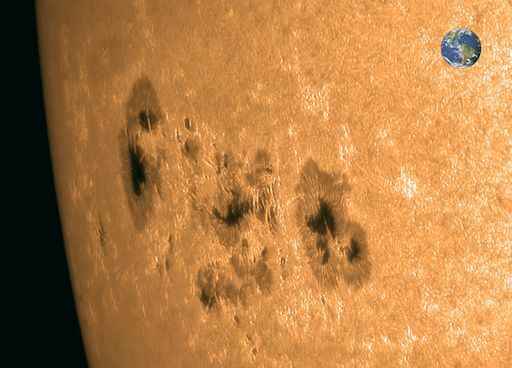 This sunspot could cause a sharp increase in solar activity over the weekend. 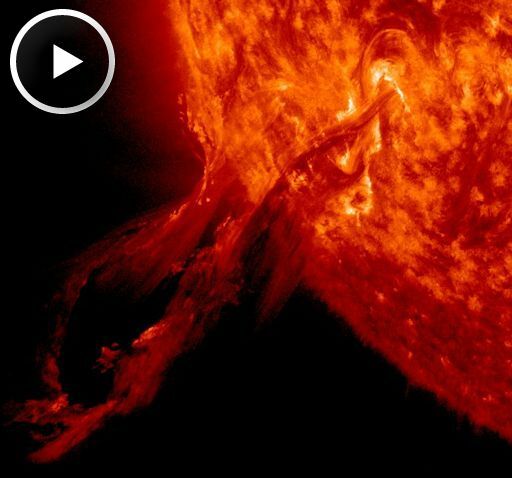 Earlier this week, while it was still hidden behind the southeastern limb, the active region unleashed several M-class solar flares and hurled a massive CME into space. Considering the fact that the blast site was partially eclipsed by the edge of the sun, those flares were probably much stronger than their nominal classification. 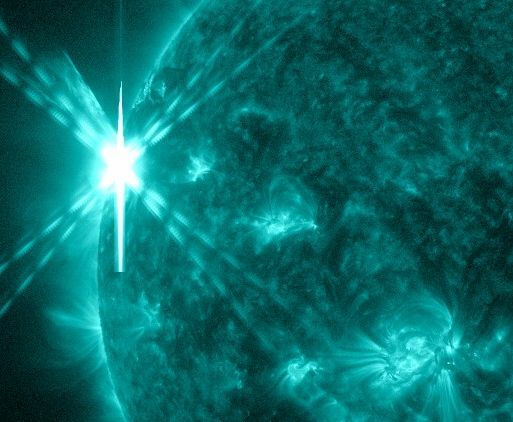 Now that the sunspot has revealed itself, X-flares may be in the offing. Everything within this dense configuration of Reality that we call the Universe is interconnected. Through this interconnectedness, everything affects everything else. From the dawn of human spiritual experiences to present-day scientific discoveries, the reality of oneness and interconnectedness has continued to permeate as a recurring aspect of existence within the vastness of what we refer to as Reality. We are realizing, with a continuously-growing conviction, that change and transformation, whether it be in society, consciousness, or otherwise is directly affected by other elements of our universe; elements that we sometimes fail to realize have the ability to affect us in such transformational ways. These connections, which many times are unable to be seen through the limited field of human awareness act as two-way portals and tunnels through which energy particles and fields travel through. This may seem like something out of a sci-fi story but has time and time again been proven to be a very genuine part of our reality. It was only in 2008 that it was publicly stated that there are magnetic portals that connect the sun’s magnetic field with the earth’s. A year earlier scientists uncovered an elaborate and vast web of cosmic filaments hundreds of millions of light years long that connect galaxies to each others. Not only are the sun and the earth linked with each other but so are galaxies light years upon light years away. Distance is no obstacle for the interconnectedness of our universe. Something that each and every one of us can do is to increase the emotional balance and coherence within ourselves.Harmony is essential in times of chaos. This will enable us as individuals to use these influxes of energy to our advantage. When we raise our internal coherence, we can positively affect our personal relationships and our social environment, which will also be positively reflected in the collective consciousness of humanity.